Product problem Alert. A Recall on Children's Medicine 2010 has been issued. McNeil Consumer Healthcare is initiating this voluntary recall because some of these products may not meet required quality standards. This recall is not being undertaken on the basis of adverse medical events. However, as a precautionary measure, parents and caregivers should not administer these products to their children. Some of the products included in the recall may contain a higher concentration of active ingredient than is specified; others may contain inactive ingredients that may not meet internal testing requirements; and others may contain tiny particles. While the potential for serious medical events is remote, the company advises consumers who have purchased these recalled products to discontinue use. Parents shouldn't use the recalled products for their kids. These include Tylenol Infants' Drops, Children's Tylenol Suspensions, Children's Tylenol Plus Suspensions, Motrin Infant Drops, Children's Motrin Suspensions, Children's Zyrtec Liquids in Bottles and Children's Benadryl Allergy Liquids in Bottles. 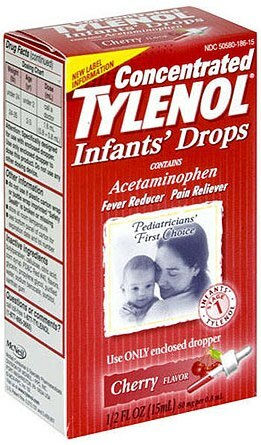 Tylenol on their website said " McNeil Consumer Healthcare, Division of McNEIL-PPC, Inc., in consultation with the U.S. Food and Drug Administration (FDA), is voluntarily recalling all lots that have not yet expired of certain over-the-counter (OTC) Children’s and Infants’ liquid products manufactured in the United States and distributed in the United States, Canada, Dominican Republic, Dubai (UAE), Fiji, Guam, Guatemala, Jamaica, Puerto Rico, Panama, Trinidad & Tobago, and Kuwait"